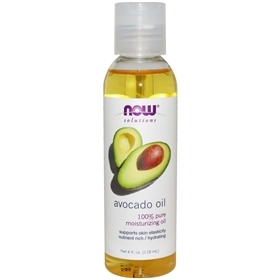 Derived from American avocados, NOW Avocado Oil is an all-natural, nutrient-rich vegetable oil that contains collagen-supporting amino acids and proteins, as well as vitamins A, D and E. Heavier in texture than many other vegetable derived oils, Avocado oils increase epidermal elasticity, while thoroughly moisturizing and softening stubborn, dry or cracked skin. When used as a massage oil, its soft, soothing and leaves no greasy residue. With a history of consumption and cosmetic use that dates back to biblical periods, the avocado continues to be one of the most highly revered of all fruits. Its oil is rich in a number of beneficial compounds that can help support healthy collagen, including monounsaturated fats and amino acids. With a unique naturally occurring nutritional profile and a creamy rich texture, avocado oil is a wonderful way to hydrate and nourish even the most dry, damaged skin. Suggested Usage: Avocado Oil can be used as a scalp or skin conditioner, or as an emollient. Our refined Avocado Oil is also edible, and generally used on salads.